Rotating Map Holder 9x9 [Sprint Race Version 9 x 9] - $59.95 : AR Navigation Supplies, Dont get lost without us! 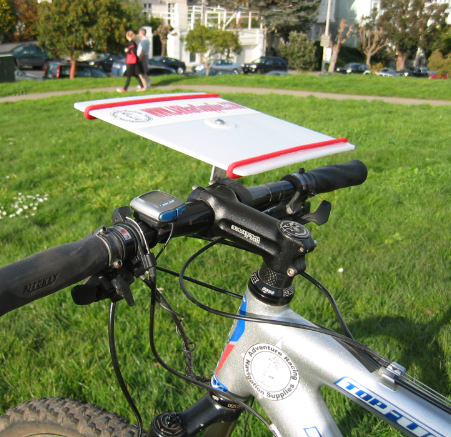 Home :: Bike Navigation :: Rotating Map Holder 9"x9"
Finally, an excellent holder at an affordable price. For Bike-O, AR or touring. Features quick release, rotating plate. Height adjusts for raised handle bars. All non-magnetic. Bungee cords hold map in place. The MBO-2 features a strong quick release bracket that allows easy removal and positioning. The height adjustment is made with a simple Allen bolt allowing easy adjustment for different handlebar configurations. Model: Sprint Race Version 9" x 9"